• Statins have the ability to lower the risk of heart attack, stroke and CARPs (coronary artery revascularization procedures such as angioplasty, stent or bypass surgery) by 25-50% depending upon the magnitude of LDL-C reduction achieved. Statin therapy reduces mortality and morbidity even in patients with pretreatment LDL-C levels as low as 60-100 mg/dL and is greatest in those who achieve an LDL-C lower than 50mg/dl.1-3 The LDL-C lowering efficacy of various statins is given in Table 029. • The lipid-modifying effects of statin therapy on LDL-C and HDL-C among South Asian patients is similar to those of Europids unlike other Asians who have a greater efficacy.11, 12 See Intensive Statin Therapy for Indians. 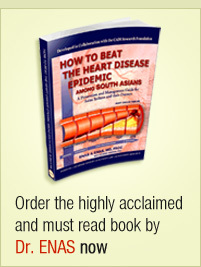 • Statins increase HDL-C levels up to 10% and increase the most protective HDL-C (large α-1 HDL particles) up to 36%. 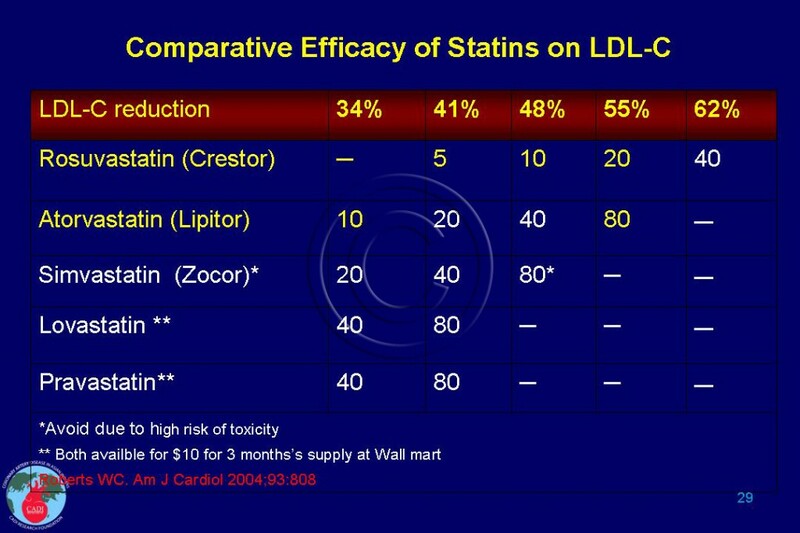 Moreover, statins decrease the harmful HDL-C (preβ-1 HDL particles) levels up to 40%. The efficacy of the different statins regarding beneficial HDL particle alteration in decreasing order is rosuvastatin, atorvastatin, simvastatin, pravastatin, and lovastatin.14, 15 It generally follows the same order as LDL lowering efficacy. • All statins lower triglycerides (TG) in a similar magnitude as LDL-C reduction (1:1) where TG levels are elevated. Accordingly statins are highly effective in lowering non-HDL cholesterol, the secondary target of treatment in people with TG. 1. Enas E.A., Hancy Chennikkara Pazhoor MD, Arun Kuruvila MBBS, Krishnaswami Vijayaraghavan MD F. Intensive Statin Therapy for Indians:Part I Benefits. Indian Heart J 2011; 63: 211-227. 2. Goldberg I.J, Eckel RH, McPherson R. Triglycerides and heart disease: still a hypothesis? Arterioscler Thromb Vasc Biol. Aug 2011;31(8):1716-1725. 3. Hsia J, Macfadyen JG, Monyak J, Ridker PM. Cardiovascular Event Reduction and Adverse Events Among Subjects Attaining Low-Density Lipoprotein Cholesterol 4. Rodes-Cabau J, Tardif JC, Cossette M, et al. Acute effects of statin therapy on coronary atherosclerosis following an acute coronary syndrome. Am J Cardiol. Sep 15 2009;104(6):750-757. 5. Brugts JJ, Yetgin T, Hoeks SE, et al. The benefits of statins in people without established cardiovascular disease but with cardiovascular risk factors: meta-analysis of randomised controlled trials. Bmj. 2009;338:b2376. 6. Mills EJ, Rachlis B, Wu P, Devereaux PJ, Arora P, Perri D. Primary prevention of cardiovascular mortality and events with statin treatments: a network meta-analysis involving more than 65,000 patients. J Am Coll Cardiol. Nov 25 2008;52(22):1769-1781. 7. Gransbo K, Melander O, Wallentin L, et al. Cardiovascular and cancer mortality in very elderly post-myocardial infarction patients receiving statin treatment. J Am Coll Cardiol. Mar 30 2010;55(13):1362-1369. 8. Califf RM, Lokhnygina Y, Cannon CP, et al. An update on the IMProved reduction of outcomes: Vytorin Efficacy International Trial (IMPROVE-IT) design. Am Heart J. May 2010;159(5):705-709. 9. Zhao SP, Peng DQ, Yu BL, Huo Y. Rationale and design of China intensive lipid lowering with statins in acute coronary syndrome: the CHILLAS study. Am Heart J. Oct 2009;158(4):509-512 e501. 10. Kelly TN, Gu D, Chen J, et al. Hypertension subtype and risk of cardiovascular disease in Chinese adults. Circulation. Oct 7 2008;118(15):1558-1566. 11. Deedwania PC, Gupta M, Stein M, Ycas J, Gold A. Comparison of rosuvastatin versus atorvastatin in South-Asian patients at risk of coronary heart disease (from the IRIS Trial). Am J Cardiol. Jun 1 2007;99(11):1538-1543. 12. Enas EA, Chacko V, Pazhoor SG, Chennikkara H, Devarapalli HP. Dyslipidemia in South Asian patients. Curr Atheroscler Rep. Nov 2007;9(5):367-374. 13. Harrington C, Horne A, Jr., Hasan RK, Blumenthal RS. Statin therapy in primary prevention: new insights regarding women and the elderly. Am J Cardiol. Nov 1 2010;106(9):1357-1359. 14. Asztalos BF, Horvath KV, McNamara JR, Roheim PS, Rubinstein JJ, Schaefer EJ. Comparing the effects of five different statins on the HDL subpopulation profiles of coronary heart disease patients. Atherosclerosis. Oct 2002;164(2):361-369. 15. Asztalos BF, Le Maulf F, Dallal GE, et al. Comparison of the effects of high doses of rosuvastatin versus atorvastatin on the subpopulations of high-density lipoproteins. Am J Cardiol. Mar 1 2007;99(5):681-685. 16. Enas E.A., Hancy Chennikkara Pazhoor MD, Arun Kuruvila MBBS, Krishnaswami Vijayaraghavan MD F. Intensive Statin Therapy for Indians:Part II Risks. Indian Heart J (In press). 2011. 17. Virani SS, Woodard LD, Landrum CR, et al. Institutional, provider, and patient correlates of low-density lipoprotein and non-high-density lipoprotein cholesterol goal attainment according to the Adult Treatment Panel III guidelines. Am Heart J. Jun 2011;161(6):1140-1146. 18. Lee E, Ryan S, Birmingham B, et al. Rosuvastatin pharmacokinetics and pharmacogenetics in white and Asian subjects residing in the same environment. Clin Pharmacol Ther. Oct 2005;78(4):330-341.